It might have all the makings of a Valentine’s Day card, but I can’t resist a pink/red colour combination—the brighter, the better. Earlier this season I picked up a red lace dress from Alannah Hill with no particular occasion in mind. These are my favourite kind of purchases; beauties bought on the spur of the moment to be tucked away until the perfect moment presents itself—especially when it’s a red dress involved. Every woman knows wearing red is like asking for attention—whether it be a frock or a striking red lip. As a result, you’ve got to be in the mood to back it up. 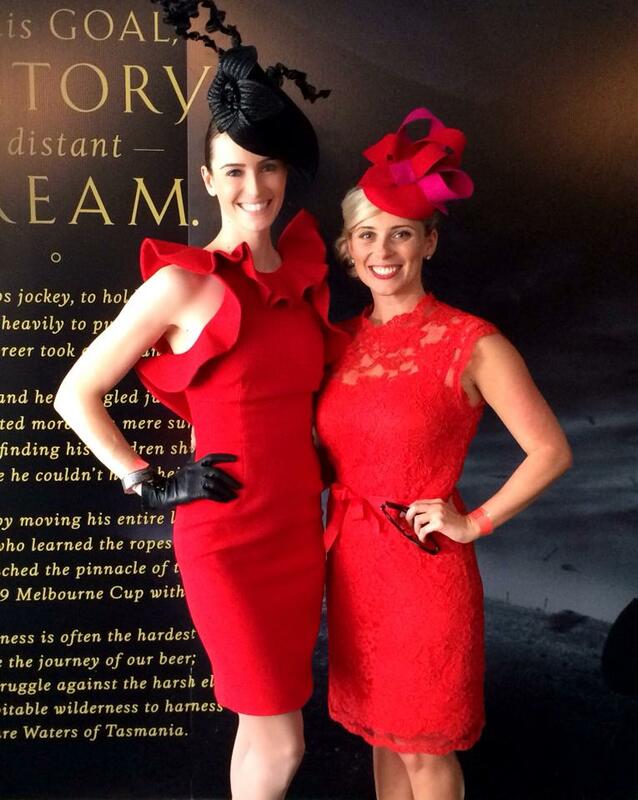 On Saturday I decided to combine my red frock and a red lip for the biggest day on Brisbane’s racing calendar—the Stradbroke Handicap. I was out to impress. A little pre-Stradbroke selfie. Make up by The Body Shop, Toombul. But, rather than fit in with the day’s ‘black, white and red’ theme, I added a some pink to the mix with a (almost) vintage Oroton clutch from 2003 and a fushcia and red fascinator. 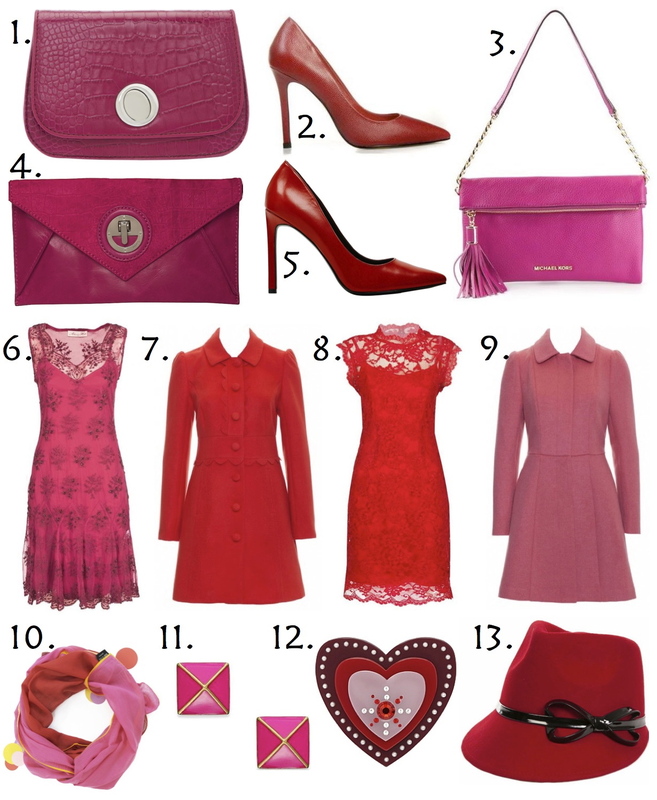 The Guardian’s fashion writer Jess Cartner-Morley said the key to pairing pink and red is to go bold. Sarah Jessica Parker and Emma Stone both rock the pink/red colour combination. Because it’s technically winter in Brisbane, I needed (yes, NEEDED) a new coat to complete my look, which led a frenzied race around Myer in my lunch break on Wednesday. 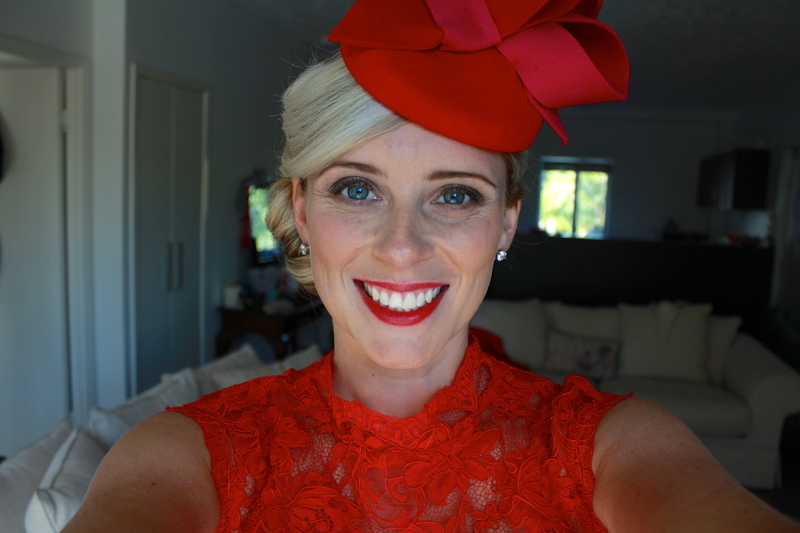 After a false start which involved a bold red wool coat which made me look a little like a member of the Royal family when teamed with my red and pink fascinator from Pink Lane Hats, I was on my way out the door when I spotted it. ‘It’ being a red and pink striped coat by Italian label, Pennyblack. It was love at first sight … and with a hefty $400 discount thanks to the sales, what I believe will be a lifelong love affair began. Now, I’ll be the first to admit, Kate probably wears it better than me (after all she is the future Queen of England) but it’s nice to know I’m in good company. 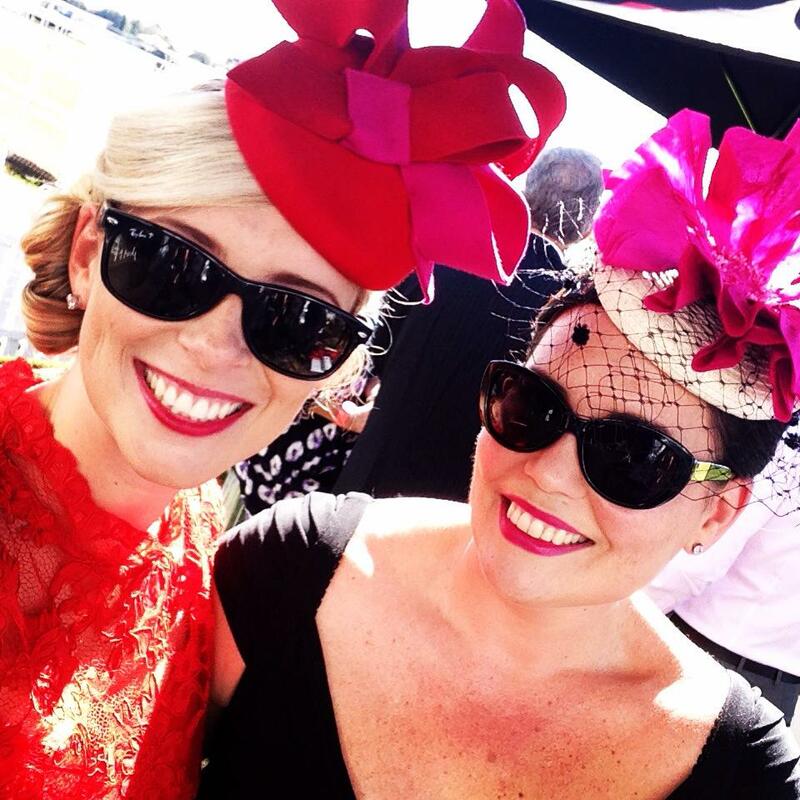 With blue skies, warm temperatures and cool cocktails, it was a brilliant day trackside. Jane and I made new friends, caught up with old ones, tested out our gambling skills (which seem to be lacking) and ran our own commentary on the passing fashions. Getting lippy … Jane and I.
Rocking some red … with the gorgeous Annie Johnson. Dress: Alannah Hill She’s From France dress | Clutch: Oroton circa 2003 | Fascinator: Pink Lane Hats Millinery | Shoes (red heels from the picture above): Jo Mercer | Coat: Pennyblack from Myer | Make up: The Body Shop | Hair: Subiaco Hair. Despite plans to rock my inner royalness, my coat was cast aside on a chair for most of the day, only getting a chance to be shown off as we made our way out the gate to head for home. Oroton Akala Emboss Mini Bag in rose, $345 (now on sale, $240) | Jo Mercer Reno in Cherry Lizard, $149 (now on sale, $120) | Michael Kors Bedford Clutch from Far Fetch, $270 | Mimco Mini Molten Envelope Clutch, $169 (now on sale instore, $49) | Nine West Tatiana in Red, $149 (now on sale, $70) | Alannah Hill Breaking My Vows dress, $469 | Review Tully Coat in Red, $299, (now on sale, $149) | Alannah Hill She’s From France dress, $329 | Review Theodore Coat, $299, (now on sale, $179) | Kish & Evie Happiness & Sunshine scarf, $52 | Kate Spade earrings | Mimco Special Effect Brooch, $60 (now on sale, $29) | Alannah Hill A Casual Encounter Hat, $89.